Bob Dylan’s Volume 13 of his Bootleg Series has been released in a number of formats including a four LP set. Trouble No More: The Bootleg Series Volume 13/1979-1981 covers one of the more controversial periods of Bob Dylan’s career. Slow Train Coming (1979), Saved (1980), and Shot Of Love (1981) found Dylan exploring his developing religious beliefs. The re-action to these gospel flavored releases was mixed but they have settled into an accepted stop in his career journey. His new four LP set has gathered 30 unreleased live tracks from his 1979-1981 tours. They include three previously unreleased songs. Tracks such as “Slow Train,” “Gotta Serve Somebody,” “Precious Angel.” “Solid Rock.” and “Saved” have more power and conviction when performed live, which make the studio versions pale in comparison. The three songs making their debut, “Ain’t Gonna Go To Hell For Anybody,” “Ain’t No Man Righteous, No Not One,” and “Blessed Is The Name” explore the fundamentalist side of his theology. These songs are quite a departure from his protest songs of the 1960’s. The sound is crystal clear, especially for liver performances that have been in the vaults for almost four decades. The tracks are not presented in any chronological order but given the cohesive nature of the material, this is not a big issue. One can’t help but wonder what other material was presented in the concerts other than the religious material. 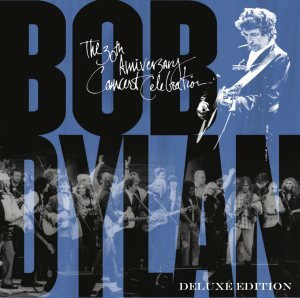 Bob Dylan seems to have an endless supply of material in the vaults and if the quality of the live material is similar to this release; there are some good times ahead for his fan base. 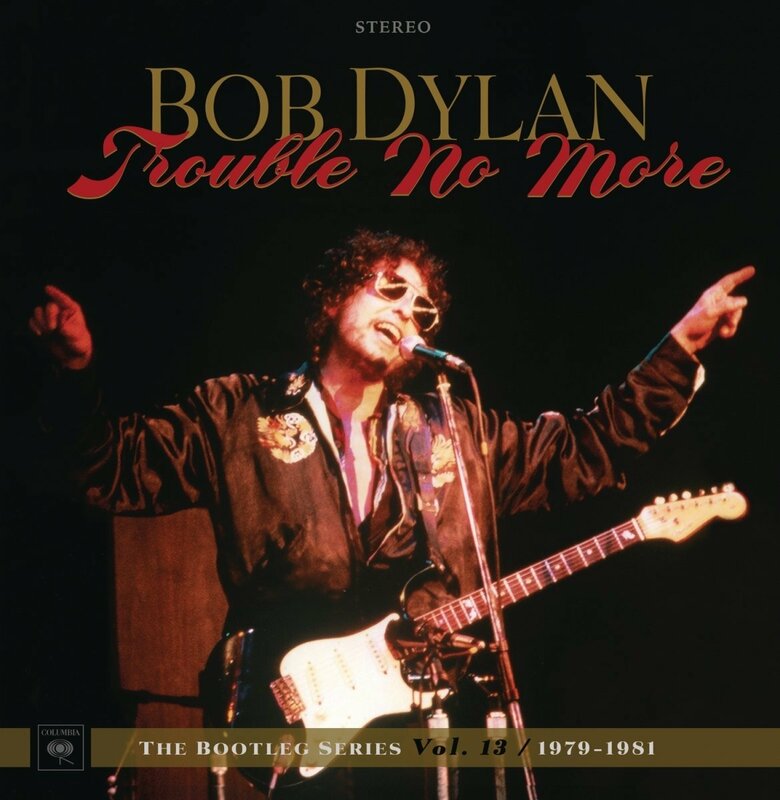 Trouble No More: The Bootleg Series 1979/1981 is one of the better releases in Dylan’s Bootleg Series. It bring to life a very specific phase of his career that is often overlooked. The vinyl component is a nostalgic bonus. The sons of Charles Truscott Wilbury were a true super group. Lucky (Bob Dylan), Nelson (George Harrison, Otis (Jeff Lynne), Lefty (Roy Orbison), and Charlie Wilbury Jr. (Tom Petty) came together as an accident, released two albums; one after Orbison’s death in December of 1988, and disbanded. Harrison, producer Lynne, along with Orbison and Petty gathered in the studio to record a B side to Harrison’s single “This Is Love.” The resultant song “Handle With Care” was so good that it was decided to release it on its own under the Traveling Wilburys moniker complete with fictitious names. Dylan later joined to make the group a quintet. Jim Keltner as Buster Sidebury was the drummer. The result of all the tongue-in-cheek shenanigans was some of the best pure rock/pop of the late 1980’s and early 1990’s. 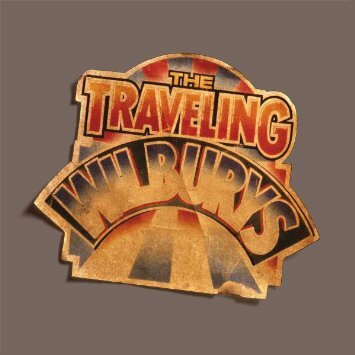 Their entire catalogue has now been released as a two CD + 1 DVD Box Set titled The Traveling Wilburys Collection. From pieces of pop heaven such as “Handle With Care,” “End Of The Line,” and “She’s My Baby” to the quirky “Wilbury Twist” and “Tweeter And The Monkey Man;” it is a journey through the best pop music has to offer. Their first album with Orbison’s soaring voice finds them at their best but everything is above the norm. Jeff Lynne is a master producer and their sound was always clear and crisp and remains so on this release. The accompanying booklet is extensive. The DVD presents a history of the band and takes one back a quarter of a century to where everyone looks a lot younger and in the case of Orbison and Harrison are still alive. The Traveling Wilburys were a short term project by five superstars. In some ways I can’t help but think the other four wanted to play with Orbison as the band only carried on for one more album following his death. They left behind a stunning collection of well-crafted music that represented a unique and creative career stop for the musicians involved. High recommended for any fan of American rock and roll. Bob Dylan’s career has now passed the half-century mark but back on October 16, 1992, he and a number of his friends gathered at Madison Square garden to celebrate his 30th anniversary. That concert has now been reissued as a two-CD, two-DVD, one Blu-ray set complete with bonus performances and new footage, which includes 40 minutes of previously unreleased rehearsals and interviews. Looking at the artists involved in the concert, one quickly realizes that many have left the building for good. Johnny Cash, June Carter Cash, Richie Havens, the three Clancy Brothers, Tommy Makem, Donald “Duck” Dunn, Levon Helm, Rick Danko, Lou Reed, and George Harrison have all passed away but at this concert they are alive and well. When it comes to Dylan, it is the songs that are important. He has produced one of the best, if not the best, catalogues of material in music history. As with all albums of this type, it revolves around the artist’s ability to interpret the material. The cream of the rock world gathered at Madison Square Garden to honor Dylan’s 30 years in music. Many of his most famous songs combine with some deeper cuts to provide a good overview of his legacy. Very important are Booker T & The MG’s, supplemented by drummer Jim Keltner, who act as the house band for many of the performances. There are a number of superior performances. Eric Clapton changes “Don’t Think Twice, It’s All Right” into a blues classic. Roger McGuinn, backed by Tom Petty and band resurrected the Byrds classic interpretation of “Mr. Tambourine Man.” Chrissie Hyde gives an emotional performance of “I Shall Be Released.” Neil Young is engaged on “Just Like Tom Thumb’s Blues” and “All Along The Watchtower.” The line-up of Dylan, McGuinn, Petty, Young, Clapton, and George Harrison on “My Back Pages” shall not pass this way again. The surprises are a sincere interpretation of “Emotionally Yours” by The O’Jays and Willie Nelson just nails “What Was It You Wanted.” Tracy Chapman, “The Times They Are A-Changin.’” Richie Havens, “Just Like A Woman,” and Mr. Dylan himself, “It’s Alright, Ma (I’m Only Bleeding)” prove that simple is sometimes best as they bring just their voices and guitar to their performances. I don’t know if there were any real misses but some performances just don’t resonate as well as others. John Mellencamp rolls through “Like A Rolling Stone” although Al Kooper brings some nostalgia to the track by re-creating his original organ sounds. Johnny Winter is technically adept on “Highway 61 Revisited” but there is a lack of passion. “Seven Days” by Ron Wood just sort of disappears. The 30th Anniversary Concert Celebration Deluxe Edition twenty years later is a look back in time. It was an evening dedicated to celebrating the music of an American music icon and in many ways that music out-shines the performers. It is a must buy for any fan of Bob Dylan and his music. It’s only eight years until Dylan’s 60th, so stay tuned. How would you like to attend a Bob Dylan concert for the price of $4.40? If you had that sum in your possession, and were at Brandeis University on the night of May 10, 1963, you would have been in luck. The college sponsored a folk festival that evening and invited a very young Bob Dylan to perform. A tape of the concert was discovered in the archives of music writer Ralph Gleason, where it had sat for nearly 40 years. The performance was recorded just prior to the release of The Freewheelin’ Bob Dylan, which would make the artist a star. Until recently the music was only available as a bonus disc on the Amazon.com release of The Whitmark Demos, 1962-1964 (The Bootleg Series Vol. 9), included exclusively in the bonus version and not the standard one. Bob Dylan In Concert: Brandeis University 1963 has now been issued as a stand-alone album. The sound is remarkably good for a recording of this type as it finds the 21 year old Dylan performing a seven-song set that clocks in at just under 40 minutes. The liner notes are provided by Michael Gray, author of The Bob Dylan Encyclopedia. Dylan is loose and at ease, playing songs that were probably second nature to him by this time. All the talkin’ blues tunes are at times funny and droll while, at others, critical and insightful. His musings about life as well as the society and world around him were always quite entertaining and thoughtful. “Ballad Of Hollis Brown” would appear on his third album, The Times They Are A-Changin’ in 1964; it’s nice to hear this early version of this underrated song. “Masters Of War” is the most sophisticated song in the set and shows that even at such a young age he could already create powerful lyrics. My favorite performance is “Bob Dylan’s Dream,” which used an old folk melody to create a song of love and loss. It’s interesting to reflect upon his dream nearly 40 years later. 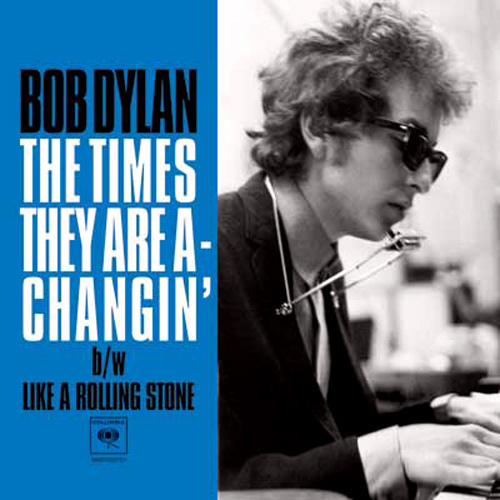 “The Times They Are A Changin'” may not have charted but it was an important song as it called for the recognition of change. Dylan’s message renews itself in every generation. The song was released about two months after John F. Kennedy was assassinated and the impact was immediate. It was embraced by the growing ant-war movement and became one of their theme songs. ROLLING ATONE MAGAZINE ranked it as the 59th greatest song of all time. If the word greatest were changed to important, it would have ranked alot higher. An essential listen for anyone who wants to understand the music of the sixties. 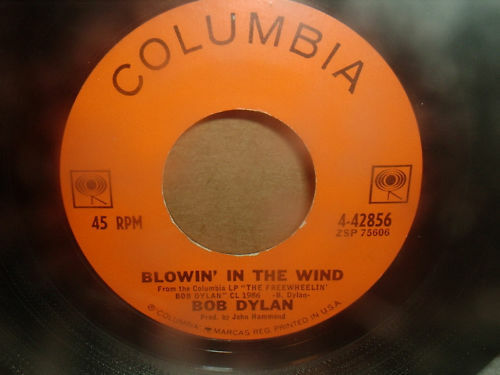 “Blowin’ In The Wind” was recorded on July 9th, 1962 for his second album, THE FREEWHEELIN’ BOB DYLAN. It remains one of the signature songs of the era and of his career. It also remains one of his most covered songs. Dylan once said he wrote the lyrics in about 10 minutes. It has the style of an old sporitual with new words. Amazingly the song did not chart when released as a single, as it was not radio friendly back in the day as its anti-establishment nature and Dylan’s delivery made it a very different type of song than what were becoming hits in the pre-Beatles era. ROLLING STONE Magazine ranked it as the 14th Greatest Song in history. Can’t Argue. ROLLING STONE MAGAZINE selected “Like A Rolling Stone” as the number one song of all time and I can’t argue with the choice. Bob Dylan was 24 when he recorded the song. It was an unusual single release because of its six minute length, but nevertheless, it would spend two weeks in the number two position on The United States singles chart. In the studio All Kooper would provide the memorable gospel type organ part and Mike Bloomfield would play the legendary guitar parts. Dylan told Bloomfield not to play the blues but just do it the way he was told. Pianist Paul Griffin, bassist Russ Savakys, and drummer Bobby Gregg completed the studio band. 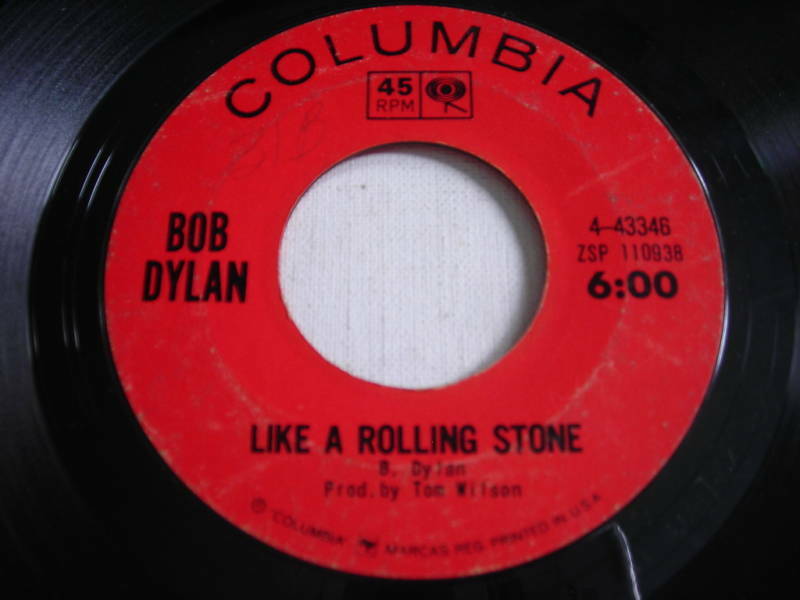 Dylan was mainly known as a folk artist at the time, but “Like A Rolling Stone” was rock ‘n’ roll at its best. It has stood the test of time and remains one of the best creations and definitive songs in music history. You are currently browsing the archives for the Bob Dylan Reviews category.